Referred to as “new garlic” or “spring garlic,” green garlic is the versatile young shoot of the garlic plant that, if left to mature, will become the garlic bulbs we’re all familiar with. Normally, when garlic is grown, it is harvested in the middle of the summer, when the lower part of the stalk becomes visible above the ground and turns brown. Green garlic, on the other hand, is harvested in the spring, before the plant has matured and the light-purple bulb resembles that of a green onion. Green garlic has a much milder taste compared to matured cloves and it provides a fresh twist in any recipe that calls for garlic. 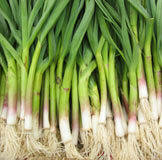 When buying green garlic, select sturdy stalks that do not appear wilted. Store green garlic in the refrigerator for up to three to five days and use stem and bulb to add gentle flavor to sautés, soups, and stir-fries. Green garlic can also be eaten raw and used in salads or sandwiches.